Chicago's Jackie Robinson West All-Stars took the U.S. title in the Little League World Series with a 7-5 win over Las Vegas' Mountain Ridge Saturday. The team started off strong, matching Nevada's three-run start and taking the lead in the second inning. The team maintained their one-point lead, keeping Nevada from scoring in the second, third, and fourth innings. Nevada regained their lead following a home run in the fifth inning, but Jackie Robinson West tied the score with a hit from Joshua Houston. Chicago then scored again later in the fifth inning, bringing the score to 7-5, which ultimately brought them to victory. “Throughout the Little League World Series, Jackie Robinson West has played with enthusiasm, energy and a whole lot of heart," Gov. Pat Quinn said in a statement. "While they have already won the hearts of fans across the country now they are officially the U.S. Champions." 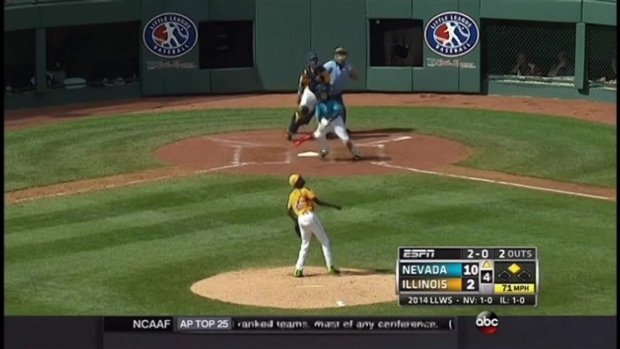 8/23/2014: The crowd goes wild as Jackie Robinson West ties Nevada 5-5 in the U.S. title game of the Little League World Series. 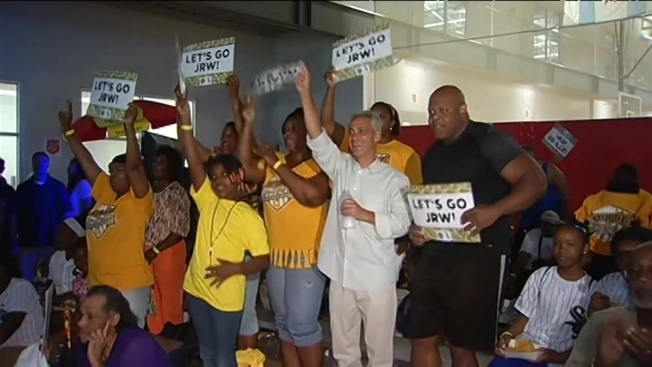 Mayor Rahm Emanuel applauded the players for becoming only the third team ever from Illinois to reach the championship game of the Little League World Series. "The City of Chicago could not be prouder of them," Emanuel said in a statement. "Their positive attitude and success on the field has rallied people from every neighborhood to support these kids and they continue to demonstrate why they are the pride of Chicago. What a comeback. What a win!" 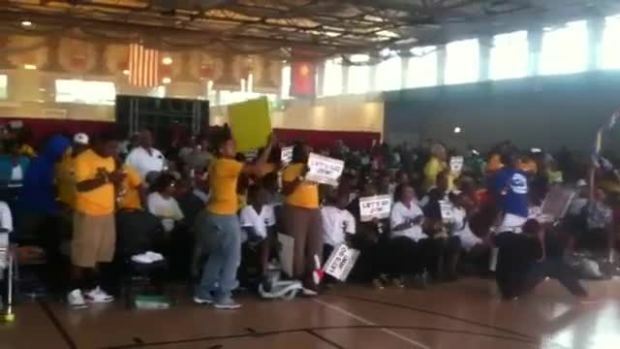 Supporters, including Emanuel and Quinn, gathered Saturday at an official watch party for the team, held at the Salvation Army Ray and Joan Kroc Corps Community Center, located at 1250 W. 119th St.
Chicago's Chance the Rapper also came to cheer on the team. Despite rain, fans also gathered on State Street, in front of the Chicago Theater, between Randolph and Lake Streets, to watch the game live on a big screen. Two more watch parties are scheduled for 2 p.m. at both locations for Sunday's game. 8/22/2014: Chicago's Jackie Robinson West will play in the U.S. title game at the Little League World Series. On Friday they took a break from the game that’s put the team on the national stage. NBC5’s Christian Farr Reports. The little league team from the South Side faced off against Philadelphia Thursday, winning 6-5 against the team that made national headlines for their star female pitcher Mo'ne Davis. The team continued its historic run with Saturday's rematch against Las Vegas. The West champions beat JRW in four innings in a mercy-rule game last Sunday behind five homers. Chicago now moves on to the World Series Championship game against South Korea Sunday. Saturday's losing teams will play in a consolation game Sunday morning. 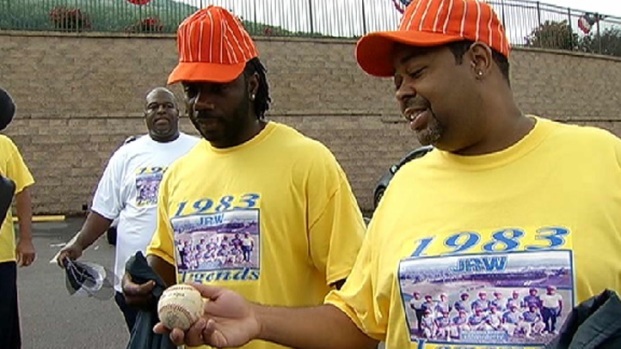 The success of Jackie Robinson West, comprised of all black players, marks the team's first appearance in the Little League World Series in 31 years. Their popularity has continued to grow throughout their journey, sparking support from Major League Baseball players and even Chicago Bears quarterback Jay Cutler. After Thursday's game, Emanuel said win or lose, the city will hold a parade for the team. 8/21/2014: Members of last Chicago team to play in Little League World Series arrived in Williamsport Thursday morning. NBC 5's Christian Farr reports from Pennsylvania. "No matter what happens these kids are champs," Emanuel said. "We will have a parade respectful of them because they are winners whatever the score is."